Okay so this product is going to appeal to mobile users and users outside typical cable/dsl coverage area's. It was either this or Satellite for me and I decided on this because it offers a 30 day trial period to test the product out were no satellite providers offer this. First off the Wireless PC card I purchased was the 595U PC card. It features a removable battery and docking station complete with a 3 foot USB cord. I have not used the actual docking station as its not needed currently. I also purchased a small antenna which actually proved to give me worse reception then I was getting without out. Most likely due to the fact I didn't have enough cable to get outside were it would pick up better reception. I had decided to wait to review this product since I'm in a Nationwide Coverage tower currently. That is 1xRtt meaning my max is 144Kbps down vs the much higher EvDO Rev A speeds. So I went down into a clearer area on a labtop to test the High speed. Once it warms up I'll get a labtop out and see if I can find a EvDO signal outside of my house which I suspect I will. At which time I'll purchase some heavy duty coax cable and run a real antenna on the roof. So here are some speed reports. Again this is for mobile and last resort users since its much higher priced than competitive cable. There data plan runs $59.99 a month. So here are the speeds. First is the 1xRtt which I'm stuck in currently. You can see its better than dial up by about 4-5X depending on your connection. Now for the High Speed test. This was a Rev-A area. Keep in mind this was in the middle of the day so I suspect download/upload would have been higher off peak times. So much better speeds. Of course there are downsides to this service. It has a monthly cap of 5GB per month were sprint mobile broadband has no cap. Sprints network is no were as large as Verizons so they were not a option for me. If you can get Sprints service I suggest you check into it for this reason. Verizon comes with what they call a VZW access manager which integrates your email, office apps, quick web link launch and even offers text messaging. Since they give you a mobile number to identify the account with people can send you texts as well as send them back out. It also does a good job of tracking your usage which you can separate by dates. It works out to roughly 166.6MB per day allowance. Since there are days I don't really use my computer the days I'm on I can download larger amounts. If your constantly on your computer daily sending/receiving large files this probably isn't for you. Like I said for mobile and last chance users. If your a big down loader I suggest looking at Wild blue because they have the best per month cap of 17GB. Hughes net limits you to 200MB per day. It does come with some handy hidden diagnostic features allowing you to see whats going on with your system and check all your RSSI dBm levels. When disconnected from the network hit CTRL+D to bring up a password prompt for system diagnostics. The password is diagvzw no spaces. In there click settings and you can select only connect to HDR (Broadband mode) instead of automatic if your on a fringe area and getting bumped between nationwide and broadband coverage. The card takes up one USB slot and isn't that large. Here is a shot of it running in a 90degree mount off a front USB port on my computer. Overall I rate this product a 8.5/10 since it does deliver when your in the range. The only thing holding it back is the 5GB month service cap thereafter they reserve the right to throttle you down to 200Kbps until the 30 day calender month is up. Also it losses .5 of a point for having no email client. Not a huge deal but you'll need to setup a 3rd party account since they provide no email service. Nice review... 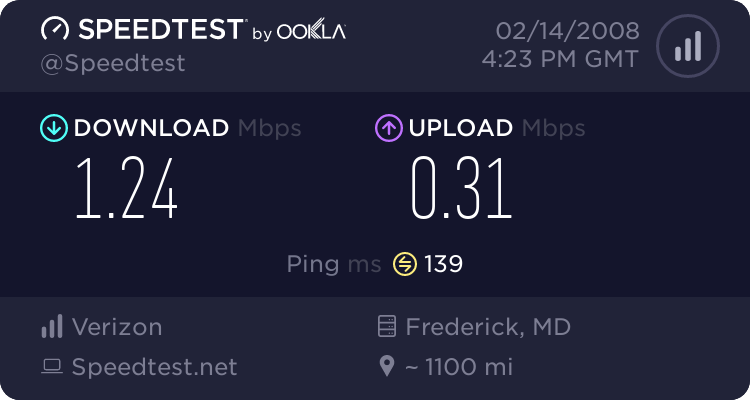 I guess anything is better than dialup. I wish I was range of something like that. Just curious have you checked there site map to see if its available? If you have or know someone with a verizon phone and they can get reception at your house then you can get this service!